I acquired, learned and even forgot how to speak languages but fortunately, I had retained the ability to re-learn these (forgotten) languages! I speak Nepali, which is my native language. During my early childhood, I learned to speak Hindi when I moved to India along with my father, who was then a British Gurkha. I also learned Marathi, an official language of the State of Maharashtra, in the primary grades in India then. After a few years, I went back to Nepal, immersed myself in Nepali but forgot how to speak Hindi or Marathi in Nepal (but interestingly enough, I didn’t know that I had retained the ability to re-learn these language later without much effort!). As well, I learned English and Sanskrit both in Nepal and India! I continued to speak Nepali and English and use Sanskrit when I moved to India for the second time. And, I quickly learned to speak and write both Hindi and Marathi fluently (This was the ability to re-learn languages I was talking about earlier!). Afterwards, I returned to Nepal; the process of visiting India time and again continued for a while but during this adulthood (,which I often call my “language-rich” period), I didn’t lose any of my language skills in Nepali, Hindi, Marathi, Sanskrit, or English. Since then, as a fluent speaker, I have been using all of these languages in different contexts, except Sanskrit, which I only use when performing rituals at home, French, which I had simply begun to learn formally at a university in Canada but don’t speak at all, and Spanish, which I had started learning in the States but have now begun to lose, sadly. Is this subtractive bilingualism? Maybe, it’s not! He was about to cry when he shared this with me, but he later collected his feelings and gradually grew confident of his ability to speak English and go back to work, as he realized during our conversation that it was not HIS use or knowledge of English language proficiency! During a recent visit to Mayfair Shopping Centre in Victoria, a new immigrant felt comfortable enough to share with me this: He said that he couldn’t speak English well, as a result of which, he couldn’t understand what one of his customers repeatedly told him the other day at work. His inability to speak ‘good English’, as this new Canadian said, made this particular customer very upset at that moment, as the customer had to utter the same thing three times. Helping the new Canadian collect and calm down, I encouraged him to continue speaking English, as he has been doing, and attempted to discourage him from feeling bad at all about the incident. And, in fact, as we continued to discuss this incident, I was able to help him realize that it wasn’t his level of English language proficiency, which was thoroughly responsible for his inability to get what the customer was saying – in fact, it was the customer who was unable to help the new Canadian understand what he really wanted to say. (There is instantly almost always a feeling of joy when one is able to help the interlocutor understand what one means to say or share!) It was the customer who didn’t realize how he should be using the language so that the new Canadian would understand and provide him with the support he was seeking to receive then. It was very much appreciated that the particular customer repeated his statements, but he seemed to have failed to communicate to some extent, (so he missed that joy!) and it isn’t the new Canadian who failed to use English or understand or respond to the customer. The customer could use different words or sentence structures and thus could rephrase his statements to convey his message, instead of reiterating the same thing. During the discussion, after I shared with him possible interpretations and what really should have happened and who should have felt sorry, the new Canadian felt comfortable enough to go back and continue his work the following day! He was happy, and so was I! Welcome to ADAPT Strategy: A 5-step Strategy for Inclusion in adult ELL Classrooms, pp. 6-9. 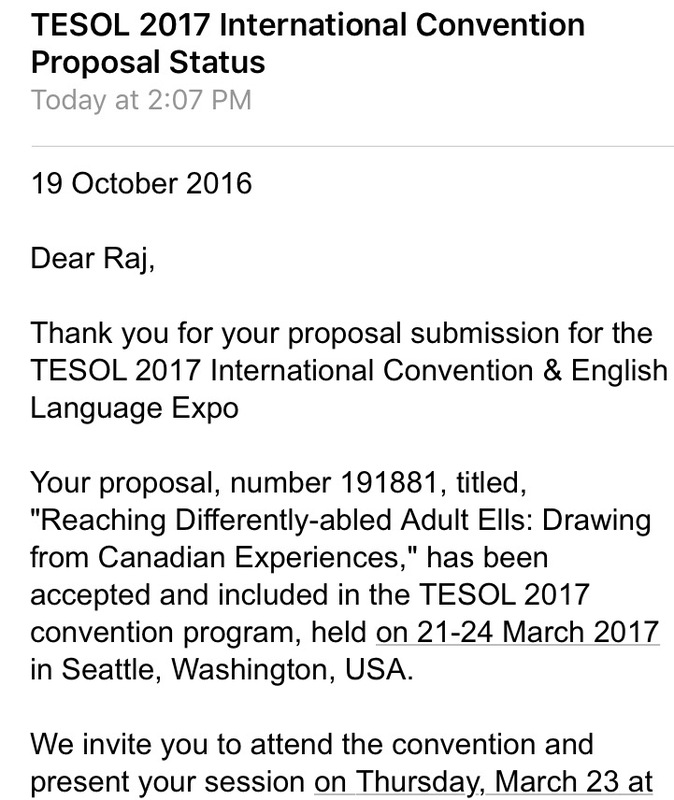 I will be presenting on “Reaching differently-abled adult ELLs: Drawing from Canadian Experiences” on Thursday, March 23 at the TESOL 2017 International Convention in Seattle, Washington! Research interest in L2 reading strategy use has been growing considerably among second language practitioners and researchers. Reading strategies are the comprehension processes employed by readers to make sense of what they read (Brantmeier, 2002). As there is a wide consensus among practitioners that the use of a variety of reading strategies can help adult ESL students develop their reading comprehension, the present research investigated adult EFL students’ perceived awareness of reading strategy use in academic context in Nepal. The findings revealed that participants used all three categories of reading strategies at a high- and medium- usage levels. However, no significant differences in overall reading strategy use were found between male and female participants. Significant differences are found between the male and female participants (p < .05) in the means of 3 of the 30 individual reading strategies. Males’ mean values are significantly higher than females’ for Global 24 and Problem-solving 25, whereas females’ mean value is significantly higher than males’ for Support 10. Among the other 27 reading strategies, there is no significant difference between males and females, although females’ mean values are higher for 17 individual reading strategies and males’ mean values are higher for 10 individual reading strategies. The overall mean value for all the strategies taken together is higher for females; however, the difference is not statistically significant. These findings indicated that this particular group of students are aware of a variety of reading strategies. Global strategies are related to reading comprehension (Anderson, 2005). As Global is the least reported category of strategies, the use of Global strategies be encouraged among the readers. It is important that readers’ awareness of appropriate strategies be promoted since when readers are aware of the reading strategies they have already identified, their conscious decision to use appropriate strategies becomes helpful in comprehension of the text (Akkakoson, 2012).